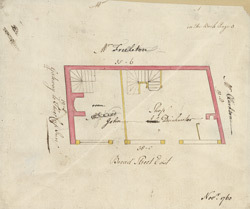 This plan comes from a rent book belonging to the Mercers' Company. One of the most prominent city livery companies, the Mercers' dealt primarily in textiles. Having amassed great wealth, they began to buy property in the City of London, which they then leased to tenants. These are properties on Bread Street, which takes its name from medieval times when it was the site of a bread market.